Learning the letters of the alphabet and writing them in both uppercase and lowercase is an important step for kids. ‘Sequencing Letters’ is a set of free, printable English activities for kids, comprising ‘Alphabet Parade’ and ‘ABC Dot-to-Dot’ activities. 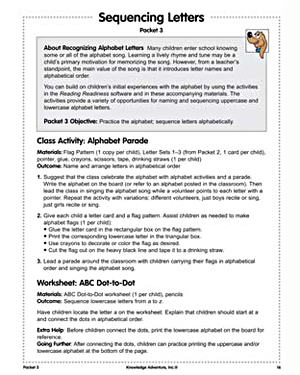 ‘Sequencing Letters’ can be used by teachers as fun classroom activities to help kindergarteners practice the alphabet. Engage the little ones with these fun English activities and watch them learn their letters well!